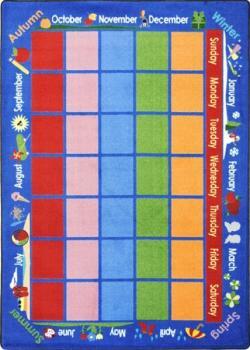 Educational Carpets and Rugs know today is your birthday! One of your students tells his parents that he slept on a calendar during nap time. Irate, one of the parents calls your school and demands to know why her son had to sleep on a calendar. You softly chuckle, before explaining that the Educational Carpets and Rugs are comfortably soft places for children to catch a wink or two. You continue by proudly stating that the rugs are made with SoftFlex®, a sturdy secondary back that protects young children from and extreme temperatures. The tightly woven surface receives antimicrobial and anti-stain treatments to ensure the children are protected from mold and mildew. As you hang up, you tell the parent that the Educational Carpets and Rugs exceeds the standards for indoor air quality. Yet, you forgot to tell the parent about the highly interactive nature of the Educational Carpets and Rugs. We design each carpet with a calendar background, that allow children to recite the days of the week and the months of the year. 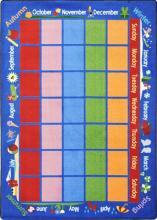 The bright colors and imaginative images attract children, who enjoy placing dates under days and months to note important holidays and classmate birthdays. You almost call the parent back to tell her about these things and that the easy to glue down rug never fades.